Average life of an aluminum gable vent is a lifetime. The average life of a plastic or vinyl gable vent is only 2 years. You decide. These Octagon Gable Vents are of a contractor grade for your to save money on your gable vent purchase. 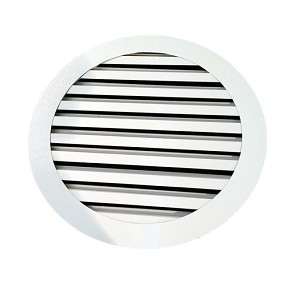 And we even added bulk quantity ordering for added savings if you order 50 or more octagon gable vents. Available in white primed aluminum only unless ordering in bulk quantity. All gable vents are manufactured 1/2 inch smaller than order measure. Order by opening size. They are just as you said. Every vent I have ever installed has drawn blood. Everyone has sharp edges and maybe I am a little accident prone. I got 4 of these and somehow I made it through the install without a scratch. I looked at the bottom of the slats and they are hemmed over. Even the edges of the nail flange is hemmed. My hands and arms thank you. This was to replace an od plastic louver that was heat warped and might have been white at one time. Kinda yellow brown now. This seems much stronger and should last a lot longer. Replaced some cheap plastic vents with these and the customer loved them. He thought I paid much more than I did.